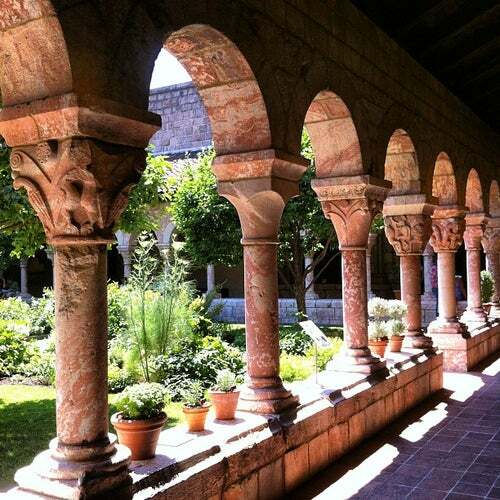 The Cloisters, the branch of The Metropolitan Museum of Art devoted to the art and architecture of medieval Europe, was assembled from architectural elements, both domestic and religious, that date from the twelfth through the fifteenth century. The building and its cloistered gardenslocated in Fort Tryon Park in Northern Manhattanare treasures in themselves, effectively part of the collection housed there. The Cloisters collection comprises approximately five thousand works of art from medieval Europe, dating from about the ninth to the fifteenth century. it's like a hidden gem. Spend a day up in Fort Tryon, it's so beautiful.